2/13-A-LGF Backside, Jangpura – ‘A’. 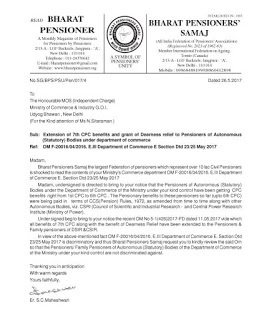 Bharat Pensioners Samaj the largest Federation of pensioners which represent over 10 lac Civil Pensioners is shocked to read the contents of your Ministry’s Commerce department OM F-20016/04/2016.E.III Departments of Commerce E- Section Dtd 23/25 May 2017. Madam, undersigned is directed to bring to your notice that the Pensioners of Autonomous (Statutory) Bodies under the Department of Commerce of the Ministry under your kind control have been getting CPC benefits right from 1st CPC to 6th CPC. The Pensionary benefits to these pensioners so far (upto 6th CPC) were being paid in terms of CCS(Pension) Rules. 1972 as amended from time to time along with other Autonomous Bodies, viz, CSIR (Council of Scientific and Industrial Research – and Central Power Research Institute (Ministry of Power). In view of the above-mentioned fact OM F-20016/04/2016. E.III Department of Commerce E. Section Dtd 23/25 May 201 7 is discriminatory and thus Bharat Pensioners Samaj request you to kindly review the said OM so that the Pensioners/Family Pensioners of Autonomous (Statutory) Bodies of the Department of Commerce of the Ministry under your kind control are not discriminated against.